Janaury 18, 2018 (Greenwich, CT) – The Greenwich Association of REALTORS® announces the statistics for home sales in The Town of Greenwich, CT for the month of December 2017. 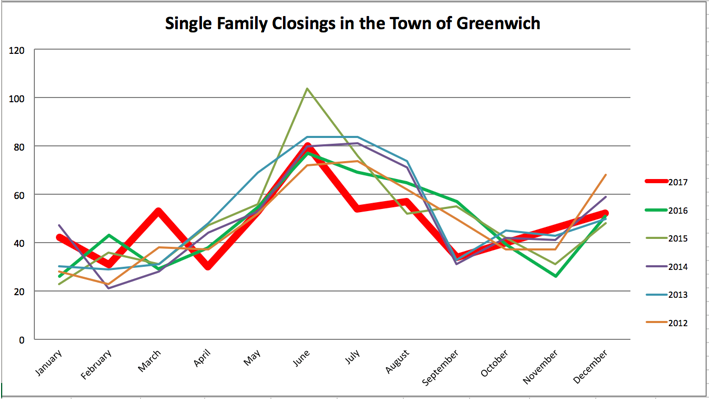 There were 52 single-family residential closings reported during this period according to figures provided by The Greenwich Multiple Listing Service, Inc., the multiple listing service used by REALTORS® in the Greenwich area. The number of single-family residential closings increased, compared to December 2016 when there were 51 closings in December. The median sale price for a single-family home increased to $1,935,500 from $1,600,000 the median sales price in December 2016. The average days on the market (DOM) for residential homes was 298 days; which was an increase from 225 days in December 2016. “December sales closed out the year consistent, with an increase of one sale for December 2017, closing in on fifty-two sales VS. December 2016 ending with fifty-one sales. The median sale price saw a large increase when compared to last year to $1,935,500 from $1,600,000 in December 2016. The Average Days on Market has increased from 225 days in December 2016 to now what is 298 days on market. Greenwich was our strongest sector this month; Greenwich closed in on thirty-five sales, from twenty-six in December 2016 with an median price increase to $2,250,000 from $2,145,000. 2017 closed out almost exactly inline with 2016’s total sales, at 572 compared to 575 in 2016. The median price for this year saw a pleasant increase to $1,869,790 from $1,703,333 when closing out 2016. We are hoping 2018 will be an even better year for our town,” stated BK Bates, 2018 President of the Greenwich Association of REALTORS®.